In researching our genealogy it’s hard to accept that our ancestor was a foundling. A ‘throw away’, a child whose mother abandoned him. We grasp at straws to discover that he was loved and cherished. We don’t really want to believe he was truly alone. Wendy was sure her Grandfather was the secret love child of his father, abandoned on the doorstep of his home in the early hours of the morning. All of his American documents gave his surname as that of his ‘father’. His parents’ names were shown on marriage documents, and yet there persisted a family story that he was adopted after the deaths of 5 baby girls. Both Wendy and her cousin had paid researchers in Italy to find the truth but all they came up with was a birth record for a foundling baby boy and a ship manifest that said he was going to his father, Luigi. Wendy had also found at home a birth extract for her Grandfather showing his (adopted) surname and the names of his (adopted) parents’. This birth extract had been requested by the Consulate in 1941 from an entirely different town in Italy than the one where Antonio was born. How could this be the same person? Since we had done work on other lines in Wendy’s family tree she asked if I could help break down this brick wall. I began by studying the birth record of the foundling baby. He was taken on April 20 1890 to the town offices by Luigi XXXXX who declared that this child had been found at his home at 3:50 am wrapped in a linen cloth. He appeared to be about 3 days old. The child was named and after assuring the official he would be able to ensure that the child was fed they gave him custody of the child. Any child born to an unwed mother was considered evidence of her sin and as such should be removed from her care. Midwives and priest were expected to assist with this process. Many young women gave birth with the help of the local midwife who then took the child to be registered before suggested a lactating woman as a suitable foster mother. Often the young woman was from nearby town or the child was taken to a nearby town for abandonment. In larger centers, the ‘wheel’ made this process easier and more anonymous. In this case, the child was fed for 3 days presumably by its natural mother before being disposed of, suggesting that the mother wanted to ‘choose’ the family to which her child was given. In fact, waiting for the twins’ burial to be over before her child was left with the family. Luigi’s wife had given birth to female twins on March 28th and both died on April 16th 1890. This was his wife’s third pregnancy and each time the child had died. I am sure they were distraught. This child was probably born right around the time his daughters had died. It must have seemed like providence. It was more likely an astute midwife who realized that this mother needed a ‘replacement’ child and with the priest’s help and the husband’s cooperation they accomplished just that. Wendy thought perhaps that the child was actually Luigi’s by another woman but it’s hard to imagine he could organize the birth to occur at the right time for his wife to still be in a position to be able to feed the child. I don’t know if Luigi had more children of his own after 1890 but if he did then it was probably because of the extra money for food they had as a result of caring for Antonio. Antonio emigrated in 1905. He was 15 years old and although he stated 17 for the manifest it was corrected before he was admitted. He was detained in Ellis Island for 2 days. He stated he was going to his father Luigi at 48 ½ Mulberry Street who had paid his fare. 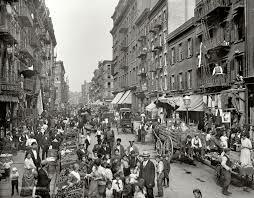 Luigi and his wife were already in USA for two years by 1905 and Mulberry Street was the destination of choice for many Italians in those days. Wendy hasn’t found Luigi and his wife in the 1905 census in Mulberry St. but then, maybe they weren’t living there and Antonio was just going there and not to his ‘father’. To see photos of the area google ‘Italian immigrants Mulberry St photos’. Wendy had been concerned that they had left a 13 year old boy to fend for himself in Italy before sending him the money to join them. The reality is that he was probably left with another family as a farm worker, working for his keep. At 13 years you were considered an adult! I have seen a child as young as 11, declaring himself to be a laborer, who was given a ‘foglio di via’ and the bus fare out of town by the Comune. Let’s now consider the birth extract Wendy found complete with the parent’s names. By 1941 Antonio had been living in America for over 35 years and all this time had used the surname of his adoptive parents, and provided their names as those of his parent’s when required. Now he needed an official birth certificate for work purposes. He must have felt like he was going to be exposed as a fraud! What was he going to do? He knew that any certificate coming from Italy would have to be in his name with the parents unknown. America must have seemed like paradise to these men and women of ‘genitori ignoti’. No one ever asked them for their father’s name, except when they married or had children, and the information they gave was accepted without requiring any proof. I have to assume he went to the Consulate and asked them to help him procure a birth certificate. Perhaps he knew other families who were from the town he gave as his birthplace and decided to use that town as a reference. Perhaps he thought the Consulate would issue the certificate based on the information he provided. Either way, he received from the town a birth extract with all the information the way he requested. It is curious though that a search of the records on the ‘antenati’ site does not show any record to support this extract. It was wartime (1941) so maybe the records were put away somewhere safe to protect them and the clerk just issued the extract based on the Consulate’s request. One thing is for sure, it is NOT the birth extract of Antonio. Conclusion: Antonio is probably not the son of Luigi although he may be related to him in some way. A truly fascinating but sad story indeed. Thank you Ann for sharing. Is it weird that I almost…like it…when records are misleading? Anyway, great post. It does make it an interesting study! I have since found a link between Antonio, and Luigi’s family. I have found a few Ancestry matches that have people in their family tree that are the same people in the tree of a man whose ancestor was Luigi’s sister Rose. Grandpa definitely was part of that family and not a foundling. One mystery solved! What a great end to this mystery, and its all thinks to DNA testing! Thank you for sharing. I now feel that I can put Luigi and his ancestors in my family tree, even if he isn’t grandpas father. At least it’s the right family!